Ingredients for making Chorizo and Scallop Bites This one is extremely tasty and decadent, yet still easy to prepare. 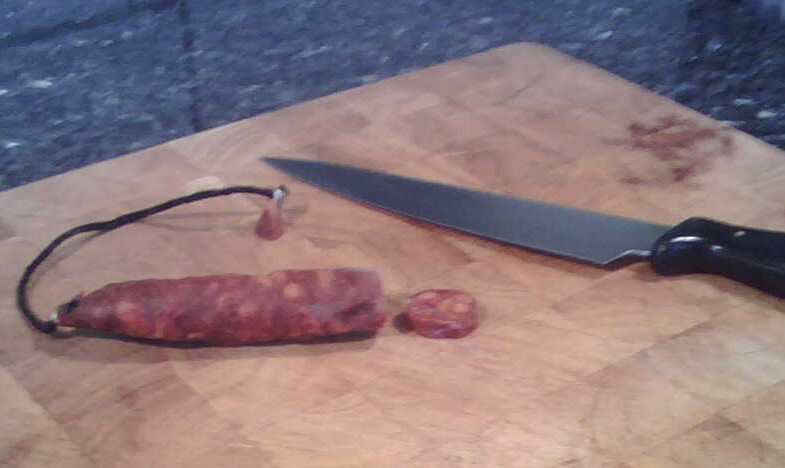 It is important to use a whole Chorizo sausage (about 3/4 inch/15mm in diameter), rather than the thinly-sliced stuff available ready sliced in packets. Prepare eight scallops: trim off the corals and any tough bits, wash well, and slice in half to form two coin-like disks. Put in a bowl, pour on the juice of a lemon, cover with clingfilm and stick in the fridge for ten or twenty minutes. Meanwhile, slice the Chorizo into rounds about 4mm thick. You will need 16 slices. Warm a tablespoon of vegetable oil in a small frying-pan and cook very gently for about ten minutes, turning once so that both sides are cooked. Leave in the pan and allow to cool very slightly. In a second small frying-pan, heat a tablespoon of olive oil, then add half an ounce of butter. When the oil and butter is nice and hot, add the scallops (not the lemon juice just yet) and cook quickly for about 45 seconds, stiring to get both sides of the disks cooked. Now add the lemon juice (sizzle!) and cook for another 15 seconds, then remove the pan from the heat. Thread a scallop disk and a round of Chorizo onto each of 16 cocktail sticks, and place on a small warmed plate. Drizzle with a little of the warm butter-and-lemon-juice from the frying pan and serve immediately.